One: (once again) get your apartment value up to within the target funds amount and move to the next apartment until you get to the last apartment. Three: Get to max level on one of your sims (other than the heir) in either branch of the Politician Career (Politician or Charity). I leave which sim and which branch up to you. Designed for 1 bedroom, 1 bath, this apartment brings back the horrors of past switches with the electric box that can go on the fritz, but at least the plumbing is sound. It’s a quick and easy starter, as well as being a great apartment to woo your sim’s romantic partner. There really isn’t a lot of room, however, so expect to probably move out before starting a family. This apartment is designed for 3 bedroom, 1 bath, and is, quite frankly, huge. It gives you plenty of room to build if you’re playing on extreme, and lots to decorate on normal. Because of the size of this apartment, I give you a wide range of target value. If you’re at the low end of the value, you will probably want to save a little extra cash so you can buy furniture when you get to the next apartment. 5,000 to spend on furniture. This is designed for 1 bedroom 2 baths, but the first thing you’ll notice is how much space you have. There’s way more room than a 1 bedroom calls for, and you’ll have fun figuring out what to do with all that space. Your second penthouse… but this one actually is a penthouse instead of a house. For Extreme difficulty players: it will need the elevator, mailbox, and trash chute. Designed for 1 bedroom, 1 bath – so it’s tiny, but don’t forget, normal difficulty players, you are welcome to move walls – or build more – in this penthouse. You are not restricted to this shell, and in fact, on normal mode, you will likely need to build some to hit your 90k value (unless you go with adding lots of paintings.. but then you have to try to fit your entire family into the tiny shell that’s built for you). 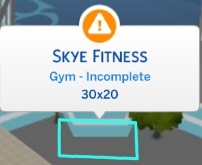 Since there’s other gyms in other neighborhoods, you are also free to build whatever you like here. Once you have minimum in value on your apartment, AND you have gotten to level 10 in the Politician Career (Politician or Charity) on one of your sims, you only need to raise your heir to the Young Adult age. Once your heir has this birthday, pause immediately and save your game. You’ll want to have as much time for the next challenge as possible. You did it! Now that you have your just-aged-up Young Adult heir, and you completed the above apartments, you are now ready to move to the next Switch. If you’ve forgotten how to move your heir out, just refer to the top of this page. —> Go to Switch Six!